Former defensive tackle for the Minnesota Vikings, Sharrif Floyd, has initiated a $180 million medical malpractice lawsuit against renowned orthopedic surgeon, Dr. James Andrews. Floyd has filed a litany of complaints against the surgeon alongside eight other named defendants in a lawsuit that alleges the doctor essentially ended his football career. Floyd alleges that he suffered muscle and nerve damage after Andrew’s clinic, the Andrews Institute for Orthopedic Surgery, negligently administered a pain blocker. According to Floyd, the surgery that Andrews was supposed to perform became much more complicated than he had initially indicated. Additionally, Floyd’s lawsuit depicts Andrews as delegating much of the administration of Floyd’s medical care to subordinates, including those who were still in training. If Dr. Andrews is found liable, Floyd could be entitled to recover damages for an injury that rendered him unable to play football any longer, including wages he would have earned in the NFL. During his time with the Vikings, it was clear that Floyd was a gifted player, possessing remarkable agility and speed for a man of his size. But he suffered a number of minor setbacks and was hampered by injuries to his knees. He sought out Andrews in an attempt to mitigate some of the damage to his knee and Andrews ended up removing some of the cartilage. According to Floyd, Andrews told him to avoid surgery and instead take a more conservative approach. Floyd was able to play the opening season game but missed the next two. He flew to Florida, where Andrews practices, to follow-up with his treatment. But upon arrival, Floyd was told that he was booked for surgery. Andrews’ staff informed Floyd that the surgery was minor and that he could return to play in three to four weeks. However, instead of performing the minor procedure that they had told Floyd he needed, they attempted to regrow cartilage in his knee—a highly invasive procedure that, even had it been successful, would have kept Floyd out of the lineup for the rest of the year. This procedure posed a serious risk to Floyd’s football career. The surgery was not successful and, without explaining the risks to him, another doctor, Gregory Hickman, performed a nerve block procedure on Floyd that carried a substantial risk of ending his career. Floyd contends that he never consented to this procedure, and even had he given his consent, it would not have been legally binding because Floyd was heavily medicated when the doctor performed the procedure. The nerve block treatment destroyed parts of his femoral and saphenous nerves. 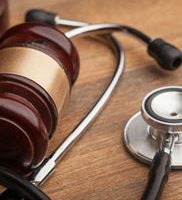 In any personal injury lawsuit, including medical malpractice, a plaintiff can sue the defendant for lost wages. Since Floyd had a potential bright career ahead of him and was finishing off the last year of his rookie contract, Sharrif Floyd’s lost wages are substantial. He is alleging that this doctor essentially ended his football career before he got his first real payday. The Palmer Law Firm, P.A. represents those who have been injured by medical and ordinary negligence in Tampa. We have successfully recovered millions of dollars in damages for our clients. Give us a call or contact us online for a free consultation.